Turing genius anticipated current research in AI field for 65 years and stated that idea of intelligent machines “cannot be wholly ignored, because the idea of 'intelligence' is itself emotional rather than mathematical” (Turing, 1948). 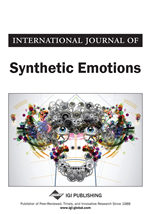 The authors' work is dedicated to construction or synthesis of computational emotional thinking. The authors used 3 bases for their work: AI - six thinking levels model described in book “The emotion machine” (Minsky, 2007). Evolutionary psychology model of emotions that is called “Wheel of emotions” (Plutchik, 2001), the authors used as subjective perception model. Neuroscience (neurotransmission) theory of emotions by Lovheim “Cube of emotions” (Lovheim, 2012) was used as objective brain emotional response model. Based on neurotransmitters impact the authors propose to model emotional computing systems. Overall presented work is synthesis of several emotional/affective theories to produce a model of emotions and affective mechanisms that fit model of six thinking levels architecture. This way all emotional processes should be expressed in terms of thinking model (levels). This could be understood as the base of computational emotional thinking approach.